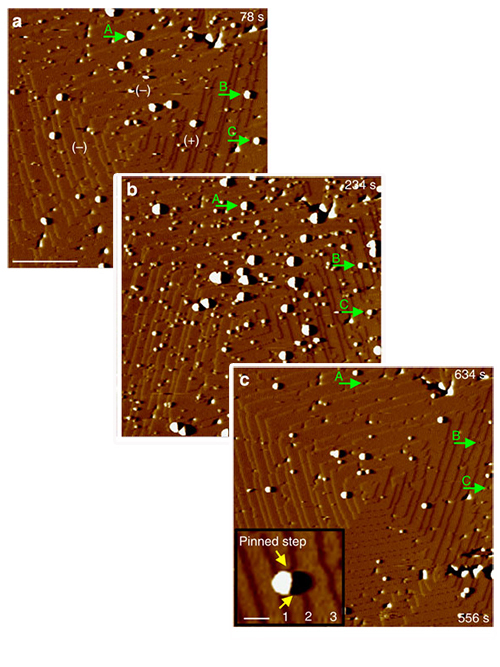 Sequential microscopy images show how particles are included on a growing calcite surface. 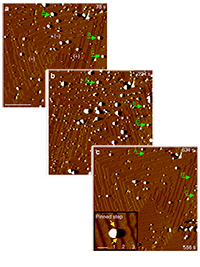 Particles indicated by arrows in the left image are slowly buried (middle image) and then completely covered (bottom image). Published in Nature Communications, an open-access journal. See Cho et al. reference at the end of the article. Seashells and lobster claws are hard to break, but chalk is soft enough to draw on sidewalks. Though all three are made of calcium carbonate crystals, the hard materials include clumps of soft biological matter that make them much stronger. A study in Nature Communications reveals how soft clumps get into crystals and endow them with remarkable strength. The results show that such clumps become incorporated via chemical interactions with atoms in the crystals, an unexpected mechanism based on previous understanding. Why It Matters: By providing insight into the formation of natural minerals that are a composite of both soft and hard components, the work will help scientists develop new materials for a sustainable energy future, based on this principle. Beautiful and functional. Calcium carbonate is one of the most important materials on earth, crystallizing into chalk, shells, and rocks. Animals from mollusks to people use calcium carbonate to make biominerals such as pearls, seashells, exoskeletons, or the tiny organs in ears that maintain balance. These biominerals include proteins or other organic matter in the crystalline matrix to convert the weak calcium carbonate to hard, durable materials. The strength of a material depends on how easy it is to disrupt its underlying crystal matrix. If a material is compressed, then it becomes harder to break the matrix apart. Proteins trapped in calcium carbonate crystals create a compressive force - or strain - within the crystal structure. Unlike the strain that makes muscles sore, this compressive strain is helpful in materials, because it makes it harder to disrupt the underlying crystal structure, thereby adding strength. Scientists understand how forces, stress, and strain combine to make strong materials, but they understand less about how to create the materials in the first place. Pearls of wisdom. The leading explanation for how growing crystals incorporate proteins and other particles is by simple mechanics. Particles land on the flat surface of calcium carbonate as it is crystallizing, and units of calcium carbonate attach over and around the particles, trapping them. For their inclusions, the team created spheres out of organic molecules and added them to the mix. These spheres called micelles are molecules that roll up like roly-poly bugs based on the chemistry along their bodies - pointing outwards are the parts of their molecules that play well chemically with both the surrounding water and the calcite, while tucked inside are the parts that don't get along with the watery environment. Better composites through chemistry. The first thing the team noticed under the microscope is that the micelles do not randomly land on the flat terraces. Instead they only stick to the edges of the steps. Finally, the team re-created the process in a mathematical simulation. This showed them that the micelles - or any spherical inclusions - are compressed like springs as the steps close around them. These compressed springs then create strain in the crystal lattice between the micelles, leading to enhanced mechanical strength. This strain likely accounts for the added strength seen in seashells, pearls and similar biominerals. Sponsors: Research on micelle incorporation and deformation was performed under the auspices of the Department of Energy, Office of Basic Energy Sciences, Division of Chemical Sciences, Geosciences and Biosciences at Lawrence Berkeley National Laboratory (LBNL) under contract DE-AC02-05CH11231 and the Pacific Northwest National Laboratory (PNNL), which is operated by Battelle under Contract DE-AC05-76RL01830. Analysis of solution micelle formation was supported by grant DC011614 from the National Institutes of Health. AFM and DLS measurements were performed at the Molecular Foundry, a National User Facility operated by LBNL on behalf of the Department of Energy, Office of Basic Energy Sciences. K.R.C. acknowledges support from the Postdoctoral Program at Lawrence Livermore National Laboratory, which is operated for the Department of Energy under Contract DE-AC52-07NA27344. The authors also thank the Engineering and Physical Sciences Research Council (EPSRC) for financial support via grants EP/G00868X/1 and EP/K006304/1 (A.K. and F.C.M.) and EP/J018589/1 (Y-Y.K. and F.C.M.). This work was also supported by an EPSRC Leadership Fellowship (EP/H005374/1; F.C.M. and Y.Y.K.). S.P.A. acknowledges support from EPSRC (EP/K006290/1 and EP/J018589/1) and also a 5-year ERC Advanced Investigator grant (PISA 320372).